A good way to make a garden more easy-care is to grow plants close together. This tends to shade out weeds, and any that do take hold are spindly and easy to pull. A good way to make a garden more easy-care is to grow plants close together. This tends to shade out weeds, and any that do take hold are spindly and easy to pull. 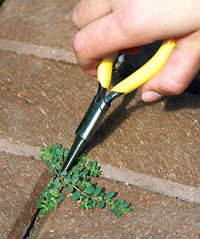 Bricks set tightly together in a path or patio make it hard for weed seeds to grow there, too. But no matter how tightly bricks are packed together, weeds seem to find their way between the crevices. Here are five tips to keep them from taking over. SKIP THE FABRIC — When installing a path, save yourself the cost of landscape fabric. Most of the weeds that grow between bricks are the result of seeds taking root at the surface, not roots coming up from below. PUT DOWN A BARRIER — Keep seeds from germinating with a corn gluten meal pre-emergent herbicide. Follow label directions and sprinkle it on the pavers. Work it into the crevices with a broom because corn gluten needs to be in contact with soil to work. Then water it in. Corn gluten can stain some surfaces if you let it sit, so test a small area first before putting it down. SPRAY SOME VINEGAR — Did you ever think that weeding could be as easy as a few squirts of vinegar? It’s true. The USDA has studied various concentrations of vinegar for use in organic farming, and found that even the stuff you have in your cupboard works to kill small weeds. Be careful using it around ornamental plants, though, as it will burn the foliage. If the weed happens to pop up again, get out your spray bottle. Another application should do the trick. GET OUT THE TARP — To avoid spreading seeds as you weed the garden, lay a tarp down on the bricks first. Then pull it along with you as you get rid of unwanted plants. What better way to celebrate spring than with lots of vibrant flowers! Here are a few favorite spring showoffs in a range of sizes to fit any garden.